Quakes regularly rattle this port city. Another 6.7-rated quake had struck in spring 2012 before my visit, with a small press group, about six months later. 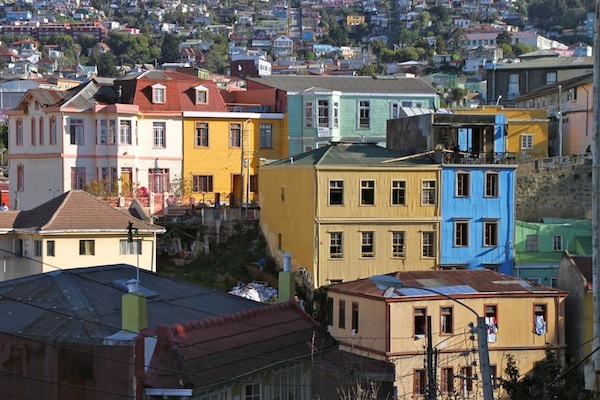 Colorful houses, with corrugated exterior walls, in the hills of Valparaiso. A place where houses appear to have been pasted to the sides of steep cliffs, the city remains as appealing to tourists as ever — and local resilience is amazing. We drove into the city on wide roads built on landfill. Our guide explained the landfill. Although Valparaiso was a good port (gaining in importance after Chilean independence in 1818), the cliffs were so close to the ocean, there was no place for a town. Much of the city is in the hills anyway, including five hills that are now UNESCO protected. 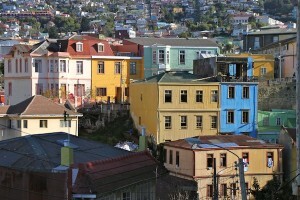 Valparaiso has a population of 300,000, but is part of a larger metropolitan area of 1.5 million people. 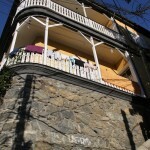 A Valparaiso hillside home secured on a dramatically tall stone support system. 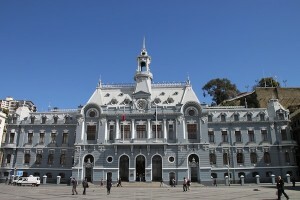 The former Valparaiso city hall, now used by the Chilean Navy, on Sotomayor Square. 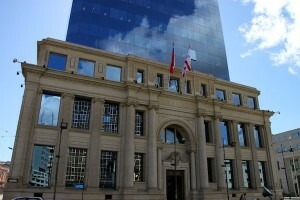 some building owners were at odds over getting rid of the offending structures. 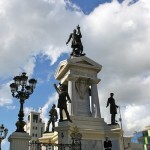 Our guided visit started at sea level in Sotomayor Square, the city’s de facto main square. A few steps away, we looked out to the Pacific Ocean across small boats used for touristic and other pleasure trips. 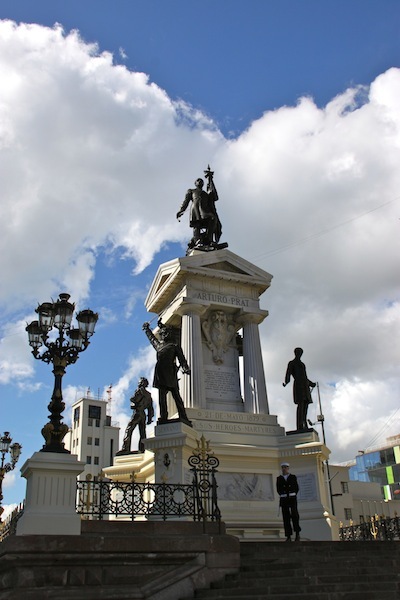 A statue of Arturo Prat, a 19th century Chilean war hero, takes center stage in the square itself. However, Americans will have heard more about two hometown boys: Augusto Pinochet and Salvador Allende. The statue of Chilean war hero Arturo Prat on Valparaiso’s Sotomayor Square. Chile’s only dictatorship. 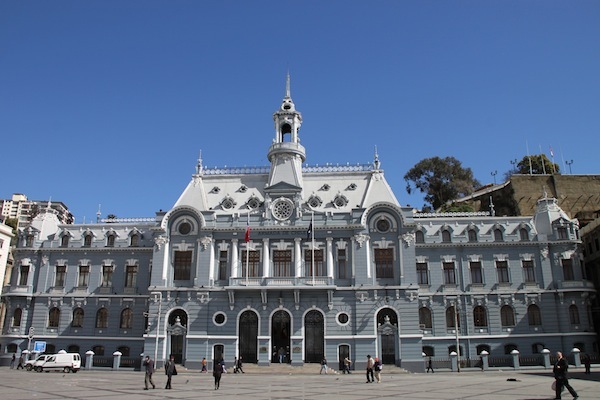 It reverted to a democracy in 1990, the same year the national Congress was relocated from Santiago to Valparaiso. As for our tour, the most dramatic building on the main square was a blue-gray 19th century Victorian, a former city hall, now belonging to the Chilean Navy. 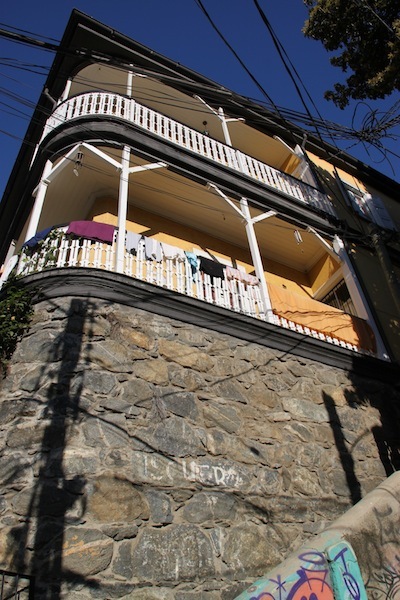 A building on Sotomayor Square that was so badly damaged in an earthquake that the interior could not be saved. Hence, the exterior envelopes the lower floors of a glass tower. Another, with an attractive front, was so badly damaged by an earthquake that its center was replaced with a glass tower and the facade saved. A second quake-ravaged building remained abandoned — and appeared to be occupied by a squatter. 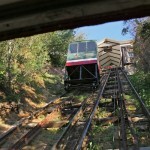 One of 13 funiculars in hilly Valparaiso. years old, and there used to be more. Carlos said they haven’t had accidents, but they didn’t have an absolute confidence-inspiring appearance either! 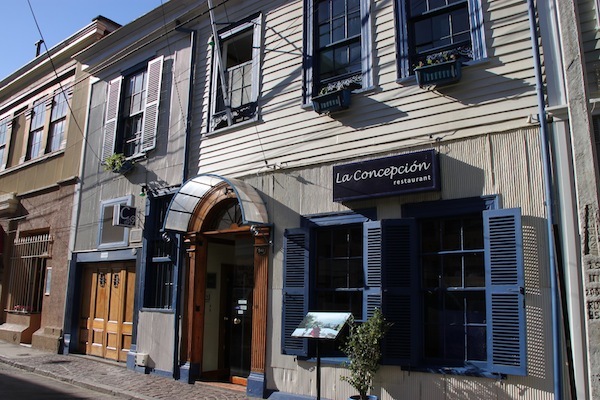 We lunched and overnighted in converted 19th century buildings on Concepcion, one of the UNESCO-protected hills. 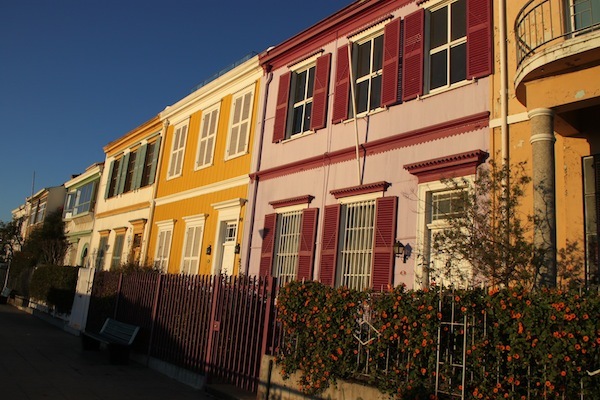 This proved a handy way to see the interiors of historic buildings and gain new vantage points to view the harbor, the ocean and Valparaiso’s hillsides covered with brightly painted perched houses, some with laundry strung from window to window. 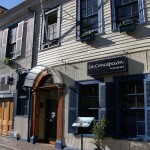 La Concepcion Restaurant, a converted 19th century house in Valparaiso’s UNESCO-protected area. property called Hotel 17. I recommend both. We saw many of the historic houses nicely restored and repurposed to create restaurants and small hotels, and maybe a few shops, too. However, many other buildings, even well painted ones, didn’t appear to be in good condition. The same was true of roads and sidewalks. Basically, Valparaiso’s old sections appeared rundown, but it was never clear which broken-down looks were quake-related. These places get their chance at repair and care as the city or private parties become interested and have the resources to do something. 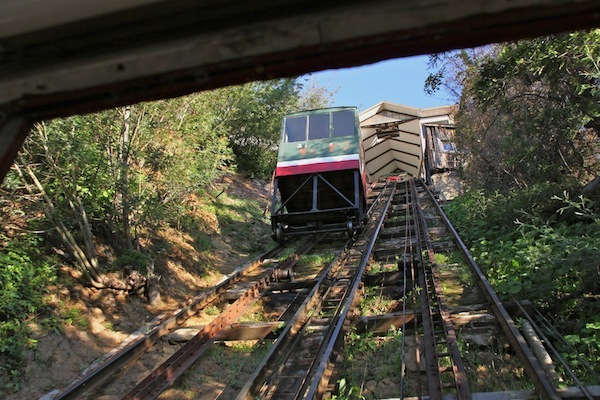 Tourist dollars are an important factor in making restoration and preservation possible. 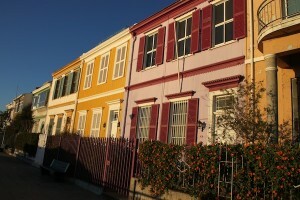 A row of houses on a terrace that overlooks the Valparaiso port from Concepcion hill. Traditionally built houses have a wood frame with adobe for walls, then a covering of corrugated iron that is painted. Carlos said the combination helps shut out port noise, tolerates seaside humidity, provides resilience in a quake-prone city and is cheap. An example of wall art found on houses and assorted walls throughout the hills of Valparaiso. Also, many exterior walls are touched by graffiti (not attractive) or artwork (sometimes attractive, sometimes not). The artwork included cartoons, political material, original art, works imitative of fine art and more. 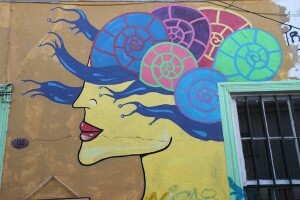 Carlos said some homeowners pay artists to paint their houses or the tall foundations that keep perched houses anchored.